Fibre Flax Farm | Linseed Oil for your well-being. Flax or linseed fibre on this page refers to food, the fibre in the seed, which is a very useful addition for a healthy diet. Dietary fibre is a lot more than just bran, the stringy bits fruits and vegetables, skins and pips! Linseed is a rich source of just the right blend of soluble and insoluble dietary fibre. It can be surprising how good adding some ground linseed to your diet can make you feel. In addition linseed is often recommended for its fibre content for various health conditions. Fibre in the diet is often pigeon-holed as insoluble fibre speeding up the digestion; insoluble fibre slowing it down and fermentable fibre as making you fart. The truth is that all dietary fibre, whether soluble, insoluble or fermentable, is not equal and largely depends on the exact type and source, whether it is associated with anti-nutrients or beneficial nutrients. Insoluble fibre holds water in the gut, contributes to structure and produces a surface area to develop good bacteria, it also makes meals seem bigger and more filling when we eat them in a non-fattening way. Soluble fibre helps keep us feeling fuller for longer. Soluble fibre also is called mucilage, which is soothing, protective and contributes with fermentable bacteria to a healthy gut flora. Good-bacteria promoting dietary fibre sometimes called fermentable fibre develops the right sort of gut flora which aids the health of your lower gut. . Ground “whole seed” linseed better than “wholegrain”: linseed contains more than twice as much fibre than oats and other whole-grains. In your digestion Linseed fibre increases bulk, provides the right soft consistency for good poo and a comfortable regular digestion. A blend of soluble fibre and insoluble fibre slows down the rate you absorb sugars and starches from your food, which is sustaining, good for keeping you feeling energised and full for longer and keeping blood sugar levels stable. Linseed is just an ordinary food even if some us us find it extraordinary. Linseed as a high fibre food is well tolerated. It is very gentle. Suitable for small children, helping size pro rata depending on weight of child. Wheat and other grains, especially whole grains are a source of fibre in the form of bran but though they ferment in the gut often don’t ferment the right way. It is their starchy compounds that ferment, often encouraging yeasts and bacteria harmful to health. The resilience of grains as a crop is partially due to anti-nutrients, including gluten, which protects them as they grow, unfortunately these compounds can be very damaging to the human digestive tract. Wheat bran helps speed up digestion for some for a while but it works by going through the gut like little scouring pads and aggravating the gut into a response. Rather than forming soft bulk, like linseed grains, often form compacted faeces. When this is combined with developing harmful bacteria and yeasts including candida it can cause bloating and IBS that can lead to a stop-start digestion, diverticulitis, leaky gut and other health problems. Many people a are looking for an alternative source of dietary fibre from grains for their digestion and linseed is an excellent choice. Where does flax or linseed fibre come from? Flax “fibre” in the UK can be a bit confusing. In the UK traditionally “flax” has referred to the long, fine fibres used to make the fabric linen, ropes and cords. This flax fibre is found in the stem of the flax plant a specific variety of Linum usitatissimum which is simply a variety of the same species as linseed but used for fibre not its oil-rich seed. 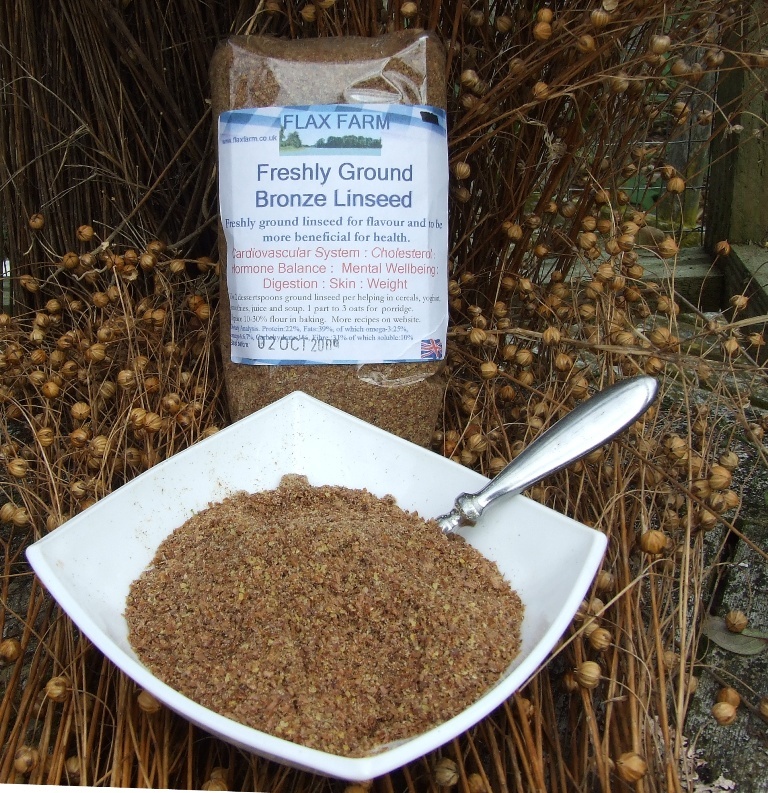 100g Flax Farm Linseed (flaxseed): 29% fibre, of which 10% soluble fibre. Two heaped dessertspoons or 25g of ground Flax Farm linseed provides 7.25g fibre; 27% of recommended daily value. 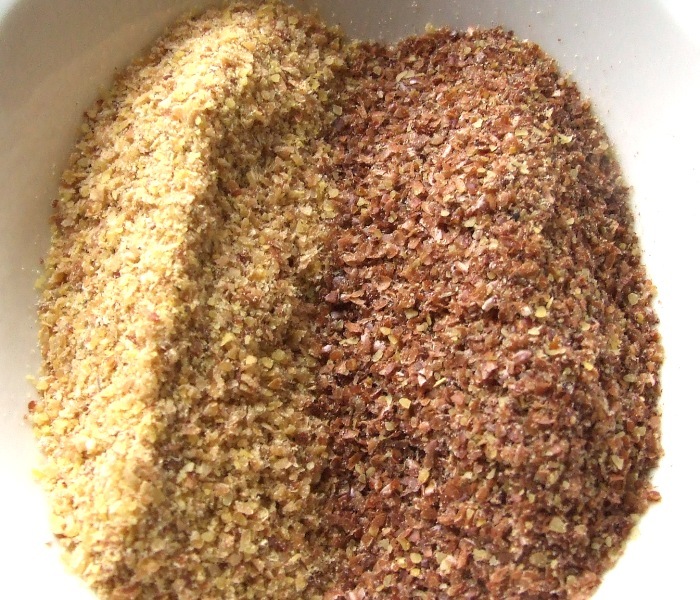 How to “take” or use linseed in your diet for fibre. You can just add 2 heaped dessertspoons or 25g Flax Farm ground linseed once or twice per day to everyday meals such as porridge or yoghurt, or add it to drinks and smoothies. Or try swapping your usual breakfast cereal for Flax Farm porridge or muesli or even have Flaxjack® with your morning coffee break. It is mainly the husk of the linseed(flaxseed) that gives you fibre. Flax Farm ground linseed or foods containing ground linseed such as Flax Farm porridge and muesli or Flaxjacks® are the best sources. The gold and bronze linseed is equally good. Whole linseed contains the fibre but a pellet like form. Whole linseeds tend to go straight through you undigested without the benefit to your digestion and poo. However you can buy Flax Farm whole gold or bronze linseed and grind it yourself in a coffee grinder. 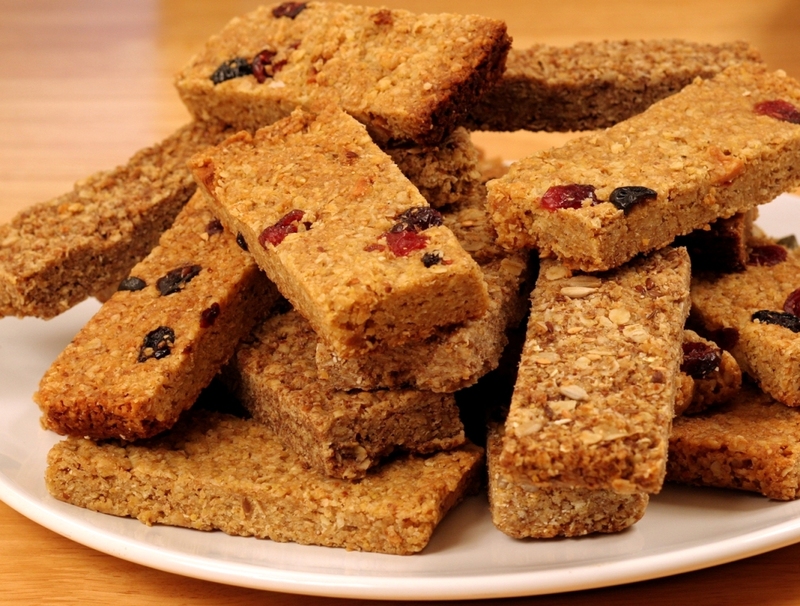 At Flax Farm we also make a great range of porridges, muesli and Flaxjacks® which are completely gluten-free and oat-free which can be a helpful source of high fibre food.